Zacks Trade Review 2019 | Rock-Bottom Prices But Good Enough? When looking around for a new brokerage account, there are a lot of questions ask. If you already know what you’re looking for and understand the dynamics of specialized day trading, then you will be hard pressed to find a better place to put your money than Zacks Trade. Zacks Trade is a respected brokerage firm out of Chicago Illinois, which has helped thousands of traders navigate global markets. As the Zacks Trade Review shows, they also offer rock-bottom commissions with highly professional trading software that most brokerages can only wish to have. Zacks Trade Pro is the premier trading platform at Zacks Trade, allowing full customization of everything you need. It has the ability to be fully customize, making the layout as simple or as advanced as you need. You can view all of your financials in one shot, giving you the ability to trade stocks, options, bonds and funds in over 19 countries from the same account. This gives you the trading world at your fingertips. You can create multiple watch lists, view all of the important figures such as balances, margin, and funds available. You can see all of the usual filled orders, and order windows. You can create real-time alerts based on price, time, margin and volume as well. This is the platform that you will use if you are a high volume trader, or perhaps somebody that does a lot of trading each session. ​Two alternatives to Zacks Trade are SpeedTrader (for U.S. residents and traders around the world) and SureTrader (for people outside the U.S.). Zacks Trade Pro gives you the most options for setting it up exactly as you wish, something that is crucial to most day traders. The best part: it’s free to all Zacks Trade clients. Zacks Trader is a browser-based trading platform. 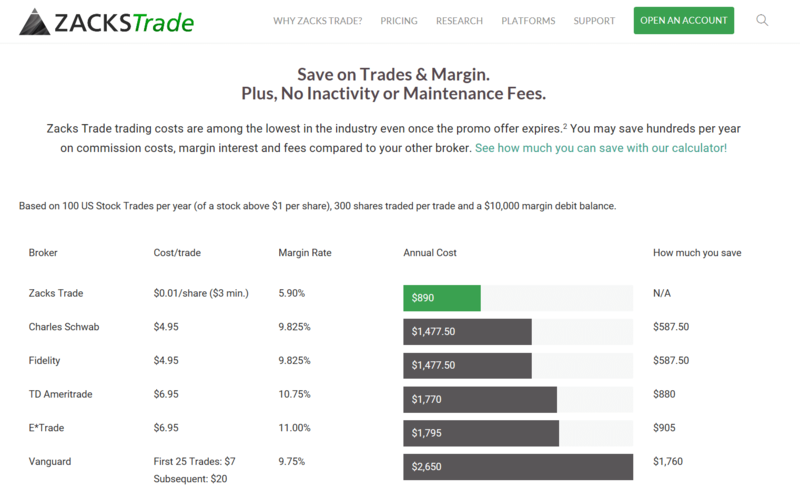 It’s essentially a scaled-down version of Zacks Trade Pro, but still has plenty of features. You have the ability to look at market data and charts just as you do in the Pro version, and you can keep track of orders and execution as well, and 90 markets worldwide. Single click orders are possible, and the best part of course is that it can be traded from anywhere with an Internet connection and a browser. You can also look at security specific fundamentals, news, and other such important pieces of information such as SEC filings. It is customizable just as the Pro version is but is much more user-friendly and doesn’t come with some of the bells and whistles. Don’t let the fact that this is a web-based trading platform fool you, it has an extraordinarily large amount of options to choose from, as well as indicators. Zacks Trader is right up there with many standalone applications that you will find it other brokerages. 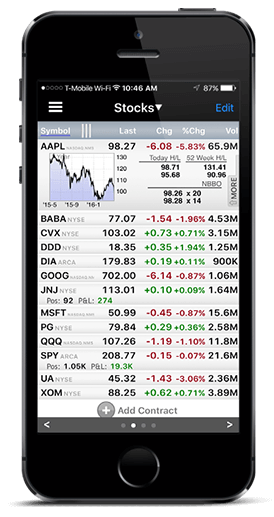 Handy Trader is a feature-rich trading platform that you can use on your iOS or android phones, giving you the ability to trade stocks, options, bonds, and mutual funds worldwide. You can view real-time streaming quotes and charts, route orders using smart routing technology, which will search for the best price and dynamically send orders to that route. You can even take a call and reconnect to Handy Trader without having to log back in. Just as in the Zacks Trader platform and Zacks Trade Pro, you can also research news and fundamental filings, and financial information. This is a full trading platform that by itself is rather powerful. When on the go, this gives you the ability to keep an eye on your portfolio, or place trades just as easily as you can from your desktop. It should be noted that this platform can run on tablet systems as well. Zacks Trade offers stock, ETF trading, options on stocks, mutual funds, corporate bonds, and government bonds. Furthermore, the brokerage allows traders to be involved in 19 separate countries around the world. Not only do you have the United States, Canada, and Mexico, but you also have Australia, several European countries, as well as Hong Kong, Japan, and Singapore. This gives you the ability to diversify your holdings, as well as trade around the clock as this gives you 24 hour coverage of the world’s financial markets. The most astonishing thing about Zacks Trade is that they offer broker assisted trades in all of these countries at no extra charge. Zacks Trade offers the usual accounts that you would expect, such as an IRA, non-IRA trading, as well as margin and reg T.
The commissions and fees at Commissions and Fees Zacks Trade are minimal to say the least. For example, to trade in the United States in the stock market, you are looking at $0.01 per share, with just a three dollar minimum on the order. Stocks and ETF orders that are less than $1.00 a share are charged at 1% of the trade value, with a $3.00 minimum. Options are $3.00 for the first contract, and then $0.75 per additional contract. Bonds are as cheap as $3.00 per bond. So the major benefits come along for stock traders while option traders should consider one of the option trading brokerage alternatives out there. ​Two of them are Interactive Brokers and SpeedTrader. Asian trades are charged and 0.3% of the trade value in the local currency, which is extraordinarily cheap. European trades are charged as little as 0.1% in the case of Norway, and as high as 0.3% in the case of the majority of the European Union such as Austria, Belgium, France, Germany, and a handful of others. It’s probably a bit of a stretch to suggest that Zacks Trade offers a lot in the way of education, but the research is very strong. You have over 20 firms providing research their client such as Seeking Alpha, The Motley Fool, Thompson Reuters, and many other well-respected research firms. You have the ability to configure which ones you want showing up in your platform, all of which are provided free to Zacks Trade clients. There are also over 80 premium research firms that are available for a nominal cost as well. If you are looking for education on how to trade, they do have a paper trading account, but as far as learning how to trade specifically, they don’t have a course as an example. However, this should not dissuade you from using the brokerage firm, because you can find plenty of educational courses online anyway. Based in Chicago Illinois, Zacks Trade is found at 10 S. Riverside Plaza. They have client support via telephone during exchange hours and extending all the way to 6 PM Eastern Standard Time, except holidays recognized by the stock exchanges in America. They also have online chat, as well as a frequently asked questions section that is quite extensive. Obviously, as most brokers, Zacks Trade also has email support. As with most stockbrokers, overnight customer support is going to be a bit lax, but they do promise to get back to you at the beginning of the next trading day. They do have an extensive “how to” video section as far as placing orders in various platforms that is rather detailed. Zacks Trade also has videos on things like account maintenance, transfers, reports, security, and many other aspects of training online. While not necessarily an educational resource as far as trading is concerned, the video section is quite good as far as managing around your account and the trading software that Zacks Trade offers. With cheap commissions, one of the biggest draws to Zacks Trade will be efficiency with your trading capital. This is truly global access at a rock-bottom price to be considered by day traders. If you need your handheld as you are just learning to trade, you probably shouldn’t be putting real money to work anyway. This is most certainly not the place to do it as you can find yourself trading stocks around the world and getting into serious financial trouble if you do not know what you’re doing. There are only a few day trading specialized brokers out there offering low stock trading commission. Zacks Trade offers you cost savings involved and of course the free platform. The platform is strong enough to rival many paid standalone platforms that you would be used to using. With all this in mind, Zacks Trade is one of the better options for day trading not only in the United States but worldwide. Trade Ideas A.I. Pro is a great addition for ZacksTrade clients. They have the ability to accept traders from over 200 countries, so do not be fooled into thinking that it is a US centric operation, quite the opposite. Many international traders will find that the commissions found that Zacks Trade are among the cheapest they can get their hands on. After all, the savvy and professional trader knows that given enough time, commissions and fees will destroy your trading profits if you are not cautious. This is by far one of the biggest draws to this brokerage, which is something that they have been a leader and for several years.